Saturday was hot, in fact this whole week is hot. Really hot. Many of my regular readers will know but for those new wild folks my PoTS causes a lot of issues with temperature regulation, as a result I’m pretty heat intolerant. It makes doing almost anything a huge challenge. This whole heat wave has left me tired, sweaty and tachycardic. I’m very much reliant on my cooling vest and other temperature regulation strategies. While I battle the heat our ongoing mission to get the house sorted is making progress. We’re making huge progress with the furniture painting and despite the heat the garden wild flowers are doing well. My office is now completely kited out (except for the laptop and internet). The living room and kitchen are looking positively lived in! After spending a lot of time at the parents house (stealing their internet and food) I was all caught up with my blog and we headed home. 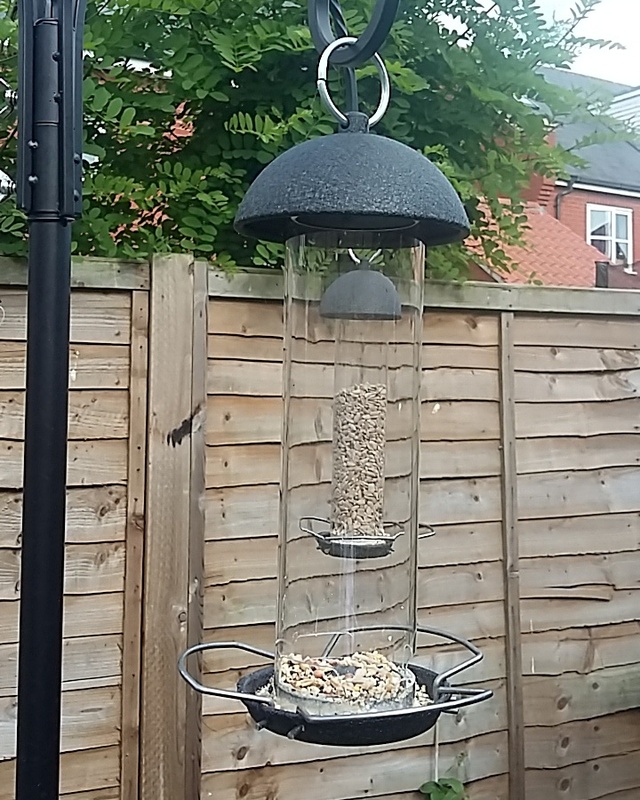 I was shocked to see that in the few hours we’d been gone the new seed feeder was completely empty! I suspect putting the water dish within seed feeder reach for the pigeons was a tactical error. I also think that living with thousands of starlings might make keeping the feeders full quite expensive! I can’t be angry with the starlings though, watching them in the evenings is fast becoming a favourite pass time for me. In fact, its fast becoming one of my favourite parts of the new home. 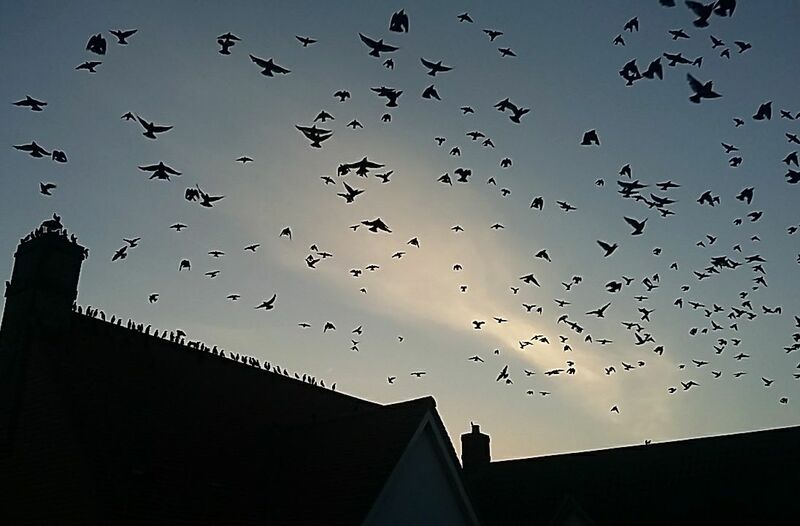 It’s wonderful watching the starlings murmur out side and above our house. I snapped this photo on my phone and popped it in the 30 Days Wild Facebook group. I was surprised and pleased to receive over 300 likes! Considering the wonderful, creative and exciting photos other people have posted it’s pretty flattering! Well done – .glad you are settling down so well. "Jo is a truly lovely person and so far I've not found anything regarding disability that she *doesn't* know anything about! So far, she's advised me on things like which wheelchair to buy (including cushions, backrests, power-assisted wheels), how to insure said wheelchair, how to walk the dog while in a wheelchair, kinesiology taping, ring splints, physiotherapy, pain management, getting an accurate diagnosis... I'm sure there's a million other things! She has always got a few good ideas about how to get around whatever barrier I'm facing and I couldn't be more grateful. Her blog is also a super-useful resource for all manner of information, she has a post about most things! She has a wealth of experience and I wouldn't hesitate to recommend her to anyone who is need of this kind of advice. Thank you Jo!"